«Ask Lisa: What is the best way to leverage eBooks on social media? Q: How can I create copy for a crowdfunding campaign? Specifically, how can I use your “Challenge. Solution. Invitation.” framework to get better results with a Kickstarter campaign? Since Kickstarter is for “creative projects,” perhaps it could address the challenge of wanting to find a place to give back, have more collaboration, support the arts, supporting each other? The solution and invitation are clearer to me. A: Sometimes “challenges” come in the form of opportunity. Crowdfuding campaigns can be a great way to rally the support of your tribe. With anything, you must be strategic about it. What’s the BIGGER purpose? Why should your tribe support it? What will the outcome be for them, for humanity, for society and for you? When crafting the “challenge” piece of content it’s important to meet people where they are and acknowledge that with empathy and understanding. Once you’re clear about WHY they should support the campaign you can speak to the purpose and how they fit into that purpose. I don’t personally have experience with this but I know Seth Godin tried his hand at it rather successfully — here’s a blog post from him that might help – click here to read it. You might also look into the IndieGoGo platform as it’s my understanding they have terms that allow you to keep contributions even if you don’t meet full goal. 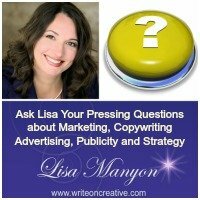 Do you have questions about branding, copywriting and marketing? Submit your questions here and I might just blog the A to your Q. AND, be sure to grab your FREE Copywriting Action Plan to help you improve your marketing messages here. This entry was posted in Ask Lisa	on Monday	November 30, 2017 at 3:50 pm. You can follow any responses to this entry through the RSS2.0 feed. You can also leave a response.